RadioWrap-Up.7.20.18.JOY at the Friday Happy Hour! How is July like your life? We're midway through the summer and, just like July, many of us are at the midlife point of our lives. We know our season isn't over...but what do we do now? Reinvention is a common topic on the Friday Happy Hour and this week we're finding out how lawyer turned coach Kathy McCabe changed careers and filled her own life with JOY! If you want more JOY in your life, tune in this Friday? Kathy's next online coaching group "Real Joy Group" is starting on Friday 7/27/18. 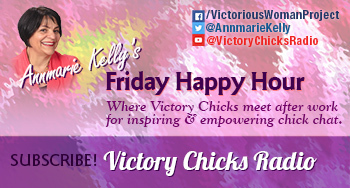 For listeners of the Friday Happy Hour with Annmarie Kelly, Kathy is offering an additional "one on one" 60-minute coaching session with Kathy if they sign up for one of her groups. Listen to the PODCAST of this show! Listen to "Adding Joy to Your Life | Kathy McCabe talks with Annmarie Kelly" on Spreaker.